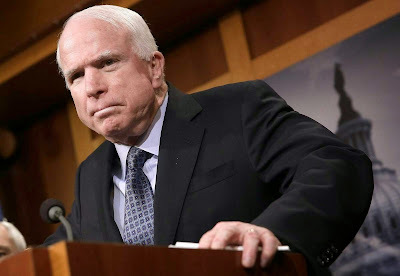 WASHINGTON, DC -- Senator John McCain said in an interview Sunday that the United States and its allies haven’t done enough to stop the bloodshed in eastern Ukraine, where government forces and Russia-backed separatists locked in battle claim a cease-fire agreement has been violated and remains fragile. Sen. John McCain (R-AZ) speaks during a press conference at the U.S. Capitol on the conflict in Ukraine, Feb. 5, 2015 in Washington, DC. “I’m ashamed of my country, I’m ashamed of my President and I’m ashamed of myself that I haven’t done more to help these people,” he told CBS’ Face the Nation. The United Nations conservatively estimates more than 5,700 people have been killed in the war since April. McCain is in the camp that thinks the U.S. should send lethal weapons to Ukraine’s military, but President Barack Obama hasn’t made a decision yet. “The Ukrainians aren’t asking for American boots on the ground; that’s not the question here,” he said. Ukrainian forces fought their way out of the strategic rail hub of Debaltseve last week, suffering a brutal and bloody defeat. The Arizona senator also made a quick dig against German Chancellor Angela Merkel and French President François Hollande, who recently helped broker the cease-fire deal in Minsk. The two have “legitimized for the first time in 70 years the dismemberment of a country in Europe,” he said.